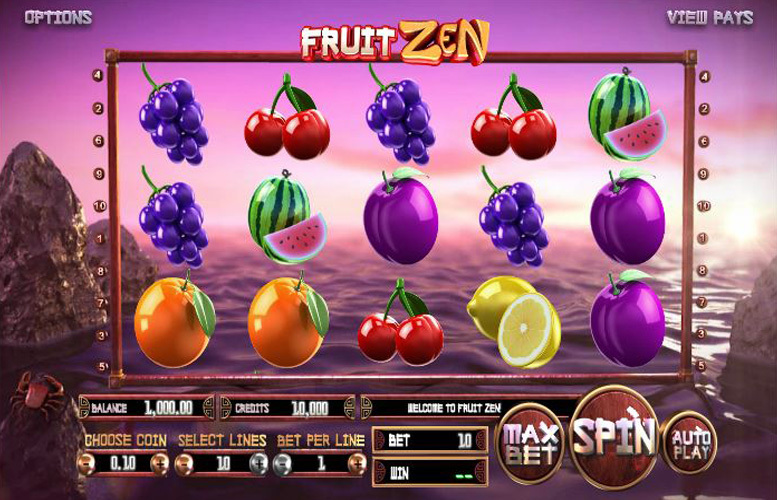 The Fruit Zen slot machine from BetSoft is a game with the tranquillity and peace of a well-seasoned Zen Master, with the addition, of well, fruit. The music is soothing and relaxing. Meanwhile, the background of waves gently lapping against the shore of a lake sets the title’s tone and feel immediately. All this is complemented by effortless gameplay which is basic yet enjoyable. The game’s only real feature is an expanding “wild” with a re-spin. However, this hardly matters, as the package is novel and strong. We’re fans of this one but be warned, it won’t be for everyone. Simplistic yet fun and modern gameplay features. We often find the most basic games get rather dull fast. However, thanks to the feel, look, and innovative use of minimalistic bonus features, that’s not the case with Fruit Zen. Genuinely relaxing. The combination of the background of water lapping up against a peaceful shore and twinkling, ethereal Eastern music creates a calming influence which some players will surely love. Very low upper betting limit. This might be a critique we make of most BetSoft titles but it’s still very much applicable. Incredibly low top jackpot figures. Fruit Zen’s highest pay-out figure is just 250x the line bet. When compared with some games that pay out 10,000x the line bet, it hardly stands up. Most games with such low top prizes usually have huge multiplier bonuses, however, this isn’t the case on Fruit Zen. *200,000 is listed as max win per spin available in bonus features. It seems Asian-themed slots love to use this feature. On Fruit Zen, winning combinations will be awarded in both directions. This means rather than strictly paying left-to-right, the game also pays for matching symbols right-to-left. The game logo “wild” symbol can only appear on reels two, three, and four. It will expand when it lands, covering the entire reel. This causes an automatic, free re-spin. If another reel lands a “wild” symbol on the reels, an additional re-spin occurs. This wild can substitute for all fruit symbols, and can of course, dramatically increase the odds of hitting a big win. As already established, there isn’t a great differentiation between the symbols on Fruit Zen. Therefore, we’ll have to skip this section. 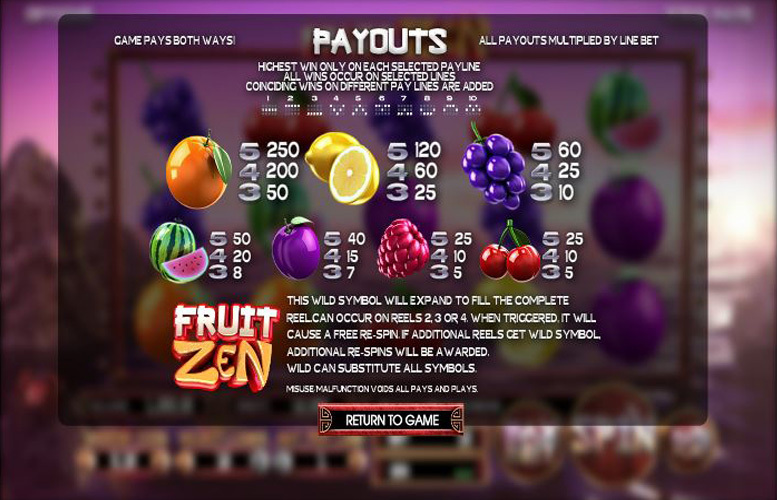 Players can adjust all aspects of their bet distribution on Fruit Zen. They can choose between one and 10 pairs of win lines, and between one and 10 coins bet on each one. In addition, they can also alter the value of every coin they bet. The highest here is £1, and the lowest just 2p. Therefore, with all values set to the minimum, the lowest possible bet-per-spin on Fruit Zen is just 2p. Meanwhile, the highest is £100. Clearly, with an upper betting limit as small as this, Fruit Zen does not cater for the highest rollers around. Whilst we’re not usually fond of such basic titles, there’s a certain charm about this one. Even despite its very low upper betting limit, and feebly poor excuse for a top jackpot, the soothing atmosphere created is worthy of praise. The game features that are used work together well and the simplistic nature of the action make it accessible and enjoyable to a wide audience. Granted, there will be many out there who can’t get into the uber-relaxant that is Fruit Zen but for those there are a plethora of noisier, more action-packed machines available. This game has a rating of 4 / 5 with 562 total reviews by the users.